I love a pasta dish that can be whipped up in half an hour. And when all of its ingredients are something I almost always have on hand, it’s even better. A few dishes that meet this criteria come to mind, such as Aglio, Olio, Pepperoncino — garlic and hot red peppers sauteed in a healthy dose of quality olive oil. Italians nicknamed this dish Pasta di Mezzanotte (Midnight Pasta) because it’s so quick and easy, it’s often the first choice when one comes home hungry after a night on the town. And there’s Penne and Broccoli, Tuna and Capers, Butter and Parmigiano, but my hands-down favorite is Spaghetti all Carbonara. It’s packed with protein and bursting with flavor. And when properly made, it’s creamy, deeply satisfying and the perfect choice for spur-of-the-moment guests. 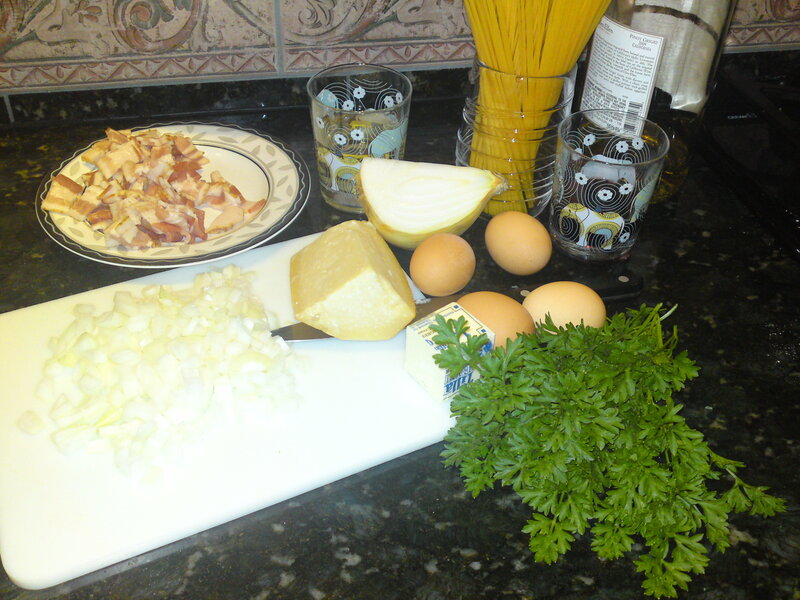 30-Minutes or Less to Carbonara! * Properly made, this dish uses barely cooked eggs. As with past recipes I’ve posted, using uncooked or barely cooked eggs comes with a warning: Although FRESH raw eggs do not usually carry Salmonella or other bacteria, it is possible. Such bacteria can be dangerous to small children, elderly, and sick people. Only use fresh eggs from a trusted source. (Thank you Ian!) If you’re not comfortable consuming raw eggs, you can buy pasteurized eggs or pasteurize your own (directions easily found online). In a frying pan large enough to hold the cooked pasta and the sauce, melt the butter and saute the chopped onions over medium heat. 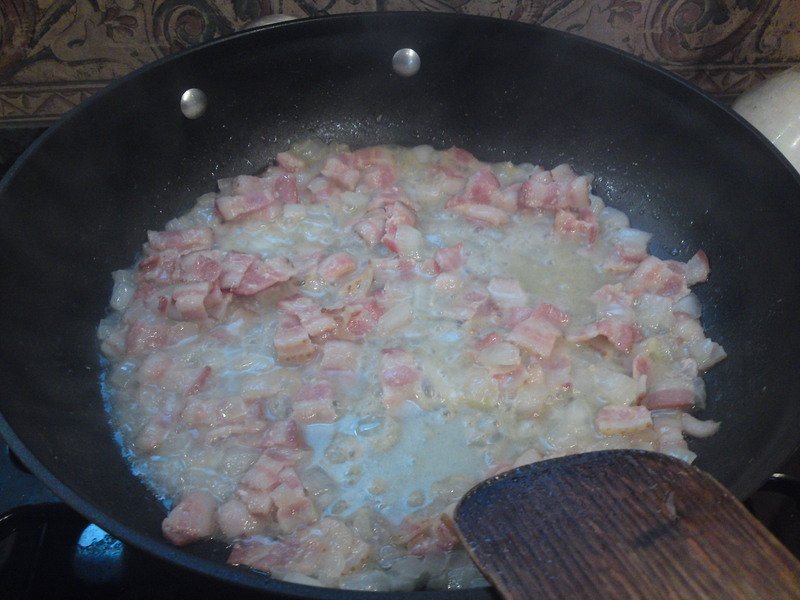 After a few minutes, when the onions soften but before they start to brown, add the bacon and the wine. Cook until the wine evaporates then remove from heat. As it is boiled rather than fried, the bacon will not (and should not) crisp. The time it takes for the wine to evaporate is plenty enough to fully cook the pork. Keep an eye on your pasta water. As soon as it boils, add the spaghetti and cook al dente. Strain the cooked pasta, reserving a tablespoon or two of cooking liquid, and add the pasta to the pan with the bacon, onions and butter. Turn the burner back on and toss with the hot oil. When the spaghetti is well-coated, REMOVE FROM HEAT. 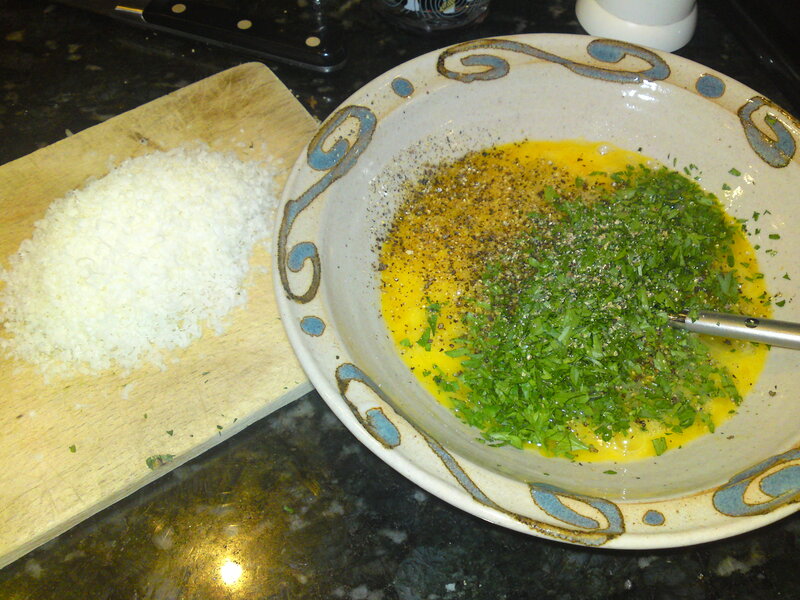 Add the egg, parsley and cheese mix and toss to mix well. Serve immediately, preferably with a loaf of crusty bread and a nice bottle of red. DO NOT COOK THE EGGS. 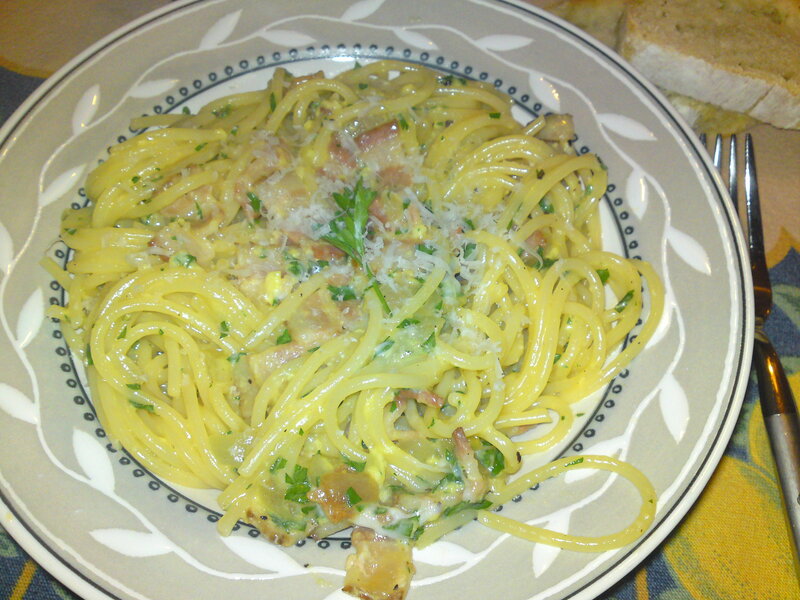 Spaghetti alla Carbonara should never NEVER never resemble spaghetti and scrambled eggs. The hot oil and pasta will heat the eggs and they may firm up in spots, but the sauce should still have a creamy appearance. Kitchen Tip: Parmigiano cheese condenses a sauce and will over-thicken it if too much is used. When recipes call for a lot of cheese, add it slowly so you can gauge when taste and consistency are in balance. In this recipe, where it’s mixed in with other ingredients, keep a few tablespoons of pasta water on hand. If the sauce dries out too much, toss in the pasta water a tablespoon at a time until it looks right. just made it tonight! big hit with the entire family! thx for the great blog. Yay! Love, love, love it. Thanks for letting me know, Michael, and buon appetito! Hey, nice! However, I had difficulty viewing your post in Safari 5. Just wanted to bring that to your attention! Thanks.